Is WSDOT aware there is never enough snow pack at Colonial Creek to even entertain winter recreating? You mention snowmachines still being unload their rigs, but there will be no snow to traverse at this new gate location. You're spinning it as if it were a win, and it's not. Be honest. This is not a win for winter recreationalists. Not as 1400 ft elevation. That's just silly. As a backcountry skier who uses a snowmobile to access higher elevation terrain I'd like to encourage you to maintain the original higher gate this winter. If we do not have snow at the lower gate it is unlikely that we'll be able to access Washington Pass from the west side. This doesnt help winter recreation access as most of the time you will be below the snow line, would be nice if the closure was pushed further east, like the Mazama access to allow easier access to the backcountry! Highway 20 in the wintertime is a beautiful place to recreate, and WSDOT is doing their best to take that from us to save a little money. Those of us on snowmobiles cant ride on asphalt, and 1400' of elevation is not enough to start from. Is there a timeline when it can reopen? Next fiscal period? After maintenance is done? For all foresable winters? Will it move up early in the spring? Were snowmobile and backcountry ski organizations contacted? Worked with? How much funding did you need? Maybe we can all work this out? Um.....this limits winter recreation. This is well below the snow line. #WSDOT please leave the gate alone. 1400 feet is too low for winter recreation. This is another example of the Forest Service not understanding how people recreate. A closed gate never helps access to recreation, no matter how hard someone tries to spin it another way. This is not a correct move for more winter recreation. Listen to the concerns of community. If there is an issue with the DOT budget start outsourcing repairs and maintenance to private managed organizations and less poorly managed government. We look forward to snow shoeing to Happy Creek every winter for easy, fun play days in the snow with all ages from little kids and teens to seniors (55+). There is no way all these ages and fitness levels will be able to make that steep, long trek anymore if we have to start at Thunder Knob. Not even sure we'd all make it to Diablo Overlook. Please reconsider and keep the gate at Ross Lake -- a much better location for all winter recreationists. This is not a positive thing! You just closed this area for all of us who recreate up there in the winter. Not sure why the gate can't be left open and signage saying that it is not plowed due to funding. We all us this area in the winter - snowmobiles, skiing, snowshoeing, dog mushing, hiking and Cross country skiing. Maybe we should do a Go Fund Me page to fund your plowing this 4 miles so we can still do our winter recreation there! Pretty sad that there was no regard to how much this is used by all users. We have a snowmobile ride that currently has over 200 members wanting to do this ride, such a sad thing to have to cancel our rides up there. Please reconsider, if funding is needed maybe all user groups can kick in some! I hope they plan to truck snow down lower to get us snowmobilers up higher. Fake news?! This HURTS recreation. Limiting access to recreation points usually does that. This is about budget cuts/reallocation; don't pass it off as "more room to roam for SR 20 winter adventurers". Is it smart or worth the cost to recreation access? ...we will see. We’re making this change to make better use of taxpayer dollars, the exact amount of savings, which will come from not plowing this 4-mile stretch during the heart of winter, will be determined after this season. We’ll move the closure point back to milepost 134 once the snowy season has stopped next spring, but that timeline is dependent on the weather. Yes, this may mean that some users may need to, or choose to, find a different area to recreate, but for many others it means a longer section of area they can enjoy car-free during the winter months. As many of us here are snowmobilers and skiers, we’re hoping for a nice snowy winter in the mountains so we all can enjoy the activities that we love. So the choice to change the closure location is being made without any forecast of the savings to wsdot? Just remove access to a multiuse winter rec area and see how much we save??? Those are OUR tax dollars and that 4 miles is important for our access which is already limited enough in this state. What users are able to enjoy bare pavement and ice patches? That is what encompasses the road that sits at 1400 feet. What sane winter recreationalist enjoys that? This is already slated to be a low snow year, so the pavement is almost guaranteed. The tone of which this is being addressed is belittling and patronizing. Do better, WSDOT. Thank you for your feedback. Yes, we know that at times snow levels might be above this closure point and snowmobilers who don’t have wheel systems, etc. and don’t want to ride on pavement may need to choose a different area to recreate. The cost to plow/safely maintain this 4-mile stretch vs. the volumes in this area during the winter months isn’t a cost efficient use of tax payer funding. Please leave the gate as is. Moving this gate lower will make it nearly impossible for winter recreationalist to use. Why limit the access to this beautiful highway to the point people cant enjoy it in the winter months. And what about recreation groups that were willing to work with WSDOT in maintaining this stretch to the original gate at MP 134? I'm a dog musher. You know what the nearest sno-park with relatively safe trail systems is from Sedro-Woolley? Lake Wenatchee, over 2.5 hours away. This isn't just snowmachines, this is dog mushers, skiers, and snowshoers. This completely prohibits any form of winter recreation in the Snohomish, Skagit, and Whatcom regions. WSDOT. Please be more transparent about your motivations here. This earlier closure is a major negative impact on the winter recreation. I think we are all curious who suggested closing the gate earlier on HWY 20 to "allow for more car free access". This will drastically limit ANY winter recreation in this area because it will not be snow covered on the highway. The extra nearly 800 ft of elevation is SIGNIFICANT for winter recreation access. Please reconsider this, thank you. If the concern is plowing, then why not consider issuing permit usage, similar to sno-parks? WSDOT, Please be more transparent with your motivations to close the highway at this new location. This closure will have a drastic and negative impact on ALL winter recreation in this area. The earlier closure will not be accessible to any winter recreation users because there will not be any snow to recreate on. I think we would all like to know what user groups were consulted to make the claim that, people want more car-less road to recreate on. This is awfully manipulative, and not appropriate communication coming from a state agency like this. The critical nearly 800 ft of elevation difference between the proposed closures is CRITICAL for winter recreation access. Please reconsider this change and communicate needs in a more appropriate way. Your supervisor should know better then to announce a last minute negative change with unquantified benefit and expect it to go over well with the public (suspect a new and inexperienced administrator looking for beans to count)... This was obviously poorly planned if you don't even have a back of the envelope rough estimate of the cost savings. Did you consider the economic impact this might have on local accommodation providers or restaurants who receive patronage from winter recreationalists? Is that loss of local revenue worth the unknown cost savings? This would mean certain doom for anyone who would like to access the trail riding system on snowmobiles!!! We can NOT ride 4 miles of pavement. Please reconsider your decision. .Would make a LOT of people happy! !😁😁😁 Thank you WSDOT!!! How is "more room to roam" an accurate title for this blog post? You are limiting access to one of the most beautiful areas for winter recreation. Closing the gate 4 miles earlier limits our ability to "roam". Please reconsider this poorly thought out decision. I understand you have budget issues but the amount of spin that this article has is insane. Do you really think insulting the intelligence of the user groups you are excluding from this area by trying to paint this as a positive was going to work? Please reconsider moving the gate from Ross Lake. I enjoy being able to go up to Happy Creek and the Ross Lake trail in the winter and having to add 8 more miles RT to that is a deal breaker. Walking up that long hill on a most likely snowless icy highway does not sound fun for anybody. I join the voices asking you to reconsider this decision for all the reasons already described eloquently above. I understand funding challenges and wish there were more funds allotted for repairing roadways. Is there another way to get the needed funding to maintain the road? I've been there in the winter and frequently no plowing is needed because the snow level is above MP 134. Just needed to slow down because of possible icy conditions. Perhaps the Sno-Park idea above? Hiker/Snowshoe/Snowmobile/Dog Mushing/Ski groups? Please keep the upper gate open to allow for better winter recreation access. All backcountry users will be pushed away with this new change. Thank you for helping to keep our winter economy alive and land access available for all. If you need more funds why don’t you start charging for a sno-park pass like they do in Oregon? You’ll get those needed funds AND you’ll be able to maintain access to higher elevations where there is snow on the ground. Realistically you’re just trying to sugar coat the way your screwing recreational backcountry users in all user groups. Having the gate at a higher elevation would help businesses around. Snowmobile's and other recreation bring revenue to the towns close to this area. By closing the road lower than was in the past will decrease recreation in that area and revenue. Please make it accessible for all types of recreation. DOT, this press release does a disservice to all that read it. It does not take much thought to see beyond the "advantages" mentioned and to see the many hardships that are going to be faced by recreationalists accessing snow from the west side of Highway 20. As mentioned by many others this adds 4 miles of road walking to the Ross Lake trailhead, Happy Creek and associated trails. Off highway skiing and snowshoe access is also reduced and replaced with 4 miles of road that is mostly surrounded by cliffs/steep hillsides on both sides of the road. The switch in future gate locations also lowers the closure location from 2,125 ft asl to to 1,210 ft asl. This will result in people being further from being able to access snow for much of the winter. Even if a diehard nordic skier or snowshoer is willing to walk on pavement until they reach the snowline this functionally stops all snowmobile access from the west side of HWY 20 for much of the winter. 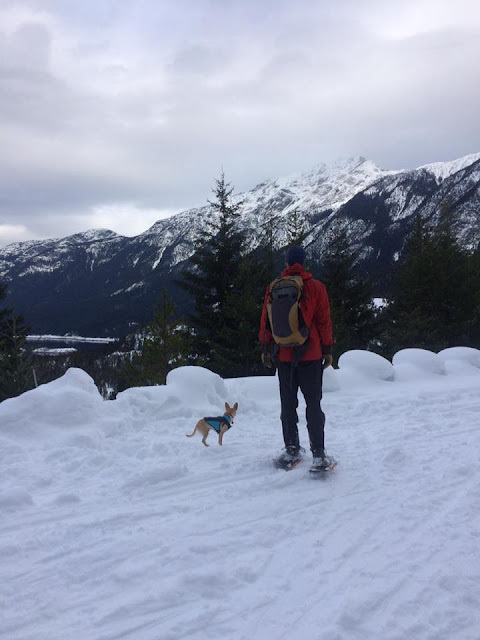 Plus do you really think that the dog in the snowshoeing picture is really capable of walking the 2-4 miles of pavement to reach the snowline? Please reconsider this shortsighted decision. So let me get this straight? I'm supposed to ride my snowmobile on dry pavement (which by the way causes damage to it) to reach the snowline now? And this increases access to public recreation? Seriously? This doesn't sound like budget cuts as much as it sounds like limiting public recreation drastically as most snowmobile's will have to find a different way into the area. I'm going to bet the gate will not last long at this location. Some industrious soul will figure out how to dismantle it. This is really a bummer for backcountry skiers/winter travelers. Almost nobody is going to want to walk the extra four miles. The closure is in no way a positive thing for winter access travel. The positive spin is an attempt to completely obscure the negative affects. Please reconsider this closure, and look to save money elsewhere. I strongly disagree with this decision, and the process and justification for it as well. Judging by the comments submitted so far, I'm in unanimous company. Please pay attention to the user groups, WASHDOT. How about only moving the closure point IF there is sufficient snowpack at the lower elevation closure point? Seems like a more fair compromise. This new closure point severely impacts those that use the higher elevations for winter recreation. The positive spin you attempt to put on this article is incredibly transparent. I find it hard to believe that the 4 miles of plowing is going to break the budget for winter operations. The attraction and beauty of the Northwest is the outdoor recreation areas it affords the public. Our tax dollars fund the operations required through state and federal monies to maintain these areas. Thats why I buy Forest passes, Discover passes, National park passes, pay my snowmobile registrations and buy any other pass required to access these areas. This is in addition to the money set aside for the highway department to keep the roads open in the winter. This is an unacceptable solution to a problem that is vague at best and has been developed by those that do not understand back country access and the people that use it for recreation. If it is truly a budget issue then close the pass a few weeks or a few snow storms earlier. This is a completely incompetent move of our public roadways. With this move you are targeting a specific user group and I would think a lawsuit would be especially helpful in this matter. This is way too low for any winter recreation. Please keep using the old location! Please reconsider the very poor decision. You just made it much harder to access the trail system around Ross Lake. Now winter canoeist and kayakers can't get to the Ross Lake trailhead in a reasonable amount of time. Shame on your for putting a positive spin on this. You are going to have bare road locked up that we own that would make it easier to enjoy the wilderness that belongs to all of us. Seriously, how much would you save anyway? Put in a a Snowpark permit system that would raise a lot of the funds you claim you need. This is ridiculous and so unnecessary. With our world moving indoors with so many tech devices at our fingertips you need to encourage people to get outside with their friends and family more often. This closure does just the opposite. We had no advanced warning of this decision and no forum to even comment on the decision before it was made. No wonder government has such a bad rep. You certainly deserve the bad rep after this ridiculous decision! This makes no sense. How are you giving winter recreationists "4 more miles" when those miles are on pavement? Snowmobiles, X-country skiers, snowshoers and dog mushers will have to traverse miles of asphalt in order to get to snow. Isn't there a way to save money elsewhere? In essence, you are closing the road to anyone who wants to use it in the winter who lives on the west side of the mountains. 4 miles of road another way. Marty Blackford: Please reconsider this decision. Winter recreation in the North Cascades is a unique experience for many and will be severely impacted by closing the gate at milepost 130. I consider this a poorly veiled attempt to limit winter access, with snowmobiles being the primary targeted group. How could anyone in a decision making capacity think this would be good news for anyone? Skiers, boarders, snowshoers, and snowmobilers. Even people just wanting to access the snow line will be impacted. WSDOT, are you totally clueless? How could you have so little understanding of the impact of this change. Disgusted. No no no!!!!! Dont even try it! Stop blocking off public access! You've got to be kidding. Way to put the screw to us. This is a huge set back to accessing this area. Can you charge us for a sno park pass permit or throw a fund raiser instead? Or perhaps only clear it Friday thru Sunday? Or at least go up the Diablo lake lookout? So, your response to many a valid concern is “Yes, this may mean that some users may need to, or choose to, find a different area to recreate”? Sounds to me like that is your end goal, anyway. Nice attitude. Ari, as a Lake Wenatchee resident, I say “come on over” y’all are welcome over here. WSDOT, was there any consideration given to the local commerce, during this, obviously in-house, decision process? As a Washington taxpayer, I believe I should have had a say in this. As a winter recreator, I believe I should have had a say in this. To quantify your position with heretofore unknown “savings”, and then tell me I may want to choose a different spot to recreate? Well, bud, that’s just what I’m gonna do. And I’m going to suggest to all the members of my snowmobile club that we do it as a group. It’s not a big group, but 30-40 sledders can spend a bunch of money in a town that welcomes them. That may not mean much to you, but to the folks in MarbleMount it means 20+ rigs that need fuel for the trip home that always stop at the shell, 30-40 people that need to get their fix at the marblemount diner(best food north of Woolley), and 30-40 people that get their caffeine injection from the local vendors(I prefer piccolo). Not to mention other incidental purchases. Now I’m sure the lack of my meager group won’t be the downfall of a town, but if everyone decides to recreate elsewhere, as you suggest, what will the impact actually be, I wonder. i wonder if you have even considered your ADA users and how much more difficult you’ve made any access to snow recreation? won’t the cost of erecting the gate be just as much as the plowing of that stretch for this season? talk about mismanagement of funds.. especially if this gate won’t be utilized after this closure because it was erected without any say from the public. reconsider before construction begins and before you waste our tax dollars! WSDOT. This is ridiculous. Almost no one is going to walk those 4 miles. You are essentially closing the area. The language about "4 more miles to enjoy winter activities" is about as far from the truth as possible. Please reconsider. Please don’t change the closure location. We need that elevation for winter activities. There are plenty of miles beyond the current gate location for us. According to who? There is not a SINGLE positive comment here. How about you don't mess with our access DOT!? WE ARE THE TAXPAYERS YOURE TALKING ABOUT! I lf you want to improve winter access you should be working on the crap pile that is HWY 2, making it two lanes each way and removing traffic lights and circles! You guys are the worst. Shame on you WSDOT, harming the people who pay for your budget. Not our fault that you mis manage your budget sooo poorly. How about you save some money and fire the person who wrote this horrible article. WSDOT is spinning this as a cost issue, if that was the case they would shut down the pass a little earlier and postpone the snow removal a little later. They would save thousands of dollars by not installing a new gate in a new location. None of this holds water. This decion has alterier motive to keep the public from accessing their lands in the winter months and they know it. This is definitely going to hurt all user groups and is a big blow for winter recreationalists like myself. Please reconsider moving the gate back to it's previous location near Ross Lake. As a business owner in Concrete I know how much winter recreation benefits us, and we have had the bonus of two recreation areas with snowmobile access. However, winters sometimes are warmer and I've heard comments from snowmobilers who had to haul snow to the parking lot at Schreiber's Meadow just to reach the trail. The higher closure point always gives them at least a chance to get into the snow at the Ross Lake gate. This will especially impact Marblemount businesses that are trying to keep open in winter. I think looking at alternatives (such as a Sno-Park Pass) and keeping the road section open will help many (including those who aren't able to climb mountains in snow shoes). Please reconsider!! This makes sense. It’s predicted to be a low snow year anyway, so the timing of this doesn’t make sense. I already frequent Fish Lake S-P, but sometimes it’s nice having local options. Hire a new PR person. They're doing a really poor job of convincing me this is a good idea. Take note of the ratio of positive to negative comments and act accordingly please. Please reconsider, this is a very detrimental change. This has nothing to do with improving winter recreation! It is all about keeping motorized recreation out of the national park! I would hope that wsdot listens to the people and finds a way to reverse this decision. This will hinder snow recreation in the area and drive people to pack into other snow parks making them more congested. This will kill small business that rely on snow recreation in the winter. Please keep the gate where it is. Or lets find it in the budget to move the gate higher and open even more winter recreation. The blatant spin of this announcement is concerning. If the cost to maintain access is an issue, work with user groups to find a solution that allows for recreation without requiring the same level of support from WSDOT. If there are other reasons to move the closure point, be honest about them. This region of the state has a tremendous amount of natural area, but most of the access points are gated far from the actual destination. Acting like its a win to add 8 miles round trip, while also inhibiting motorized access, is disingenuous. The pool of users who are physically able to reach formerly popular destinations will be significantly reduced. This is public land, and the public has a right to access it. WSDOTs cynical, non-quantitative, access closure in a period of strong winter recreation growth is unacceptable. This closure means LESS access on Hwy 20. Please contact your representatives to advocate for removing this closure. Thank you WSDOT for actually listening and responding to the user groups. Please work with the various user groups in the future so we can avoid a potentially angry backlash. We recognize the work you do, and want to move forward in a way that meets everyones needs. Well that went over like a fart in church now.... didn’t it? I am glad to see that the DOT is listening. I see though that the revised plan does nothing for cc skiers or anyone on foot. As I see it the DOT is pandering to the loudest group in an attempt to get them off their bank and ignoring everyone else. At low elevations the snow quickly turns to ice and is far less than ideal and it’s a long haul to get high enough to get decent snow. Anyone who has lived here and spent any time at all in the mountains during the winter months know that at low elevations the snow surface very often skins over with a layer of ice that in periods of cold clear weather often lasts quite a while. For skiers it can be at the least unpleasant, at the worst, dangerous. As one previous commenter said, if you wreck it people won’t come and business in the area will suffer for it. I support the idea of a parking or use fee if the state needs the cash. Thanks DOT. As a skier as well as a snowmobiler I would ask that you communicate with other recreation users as well as these decisions are made. A variety of users take advantage of that trailhead as well as snowmobilers. WSDOT, you should be plowing more of Hwy 20, not less. Access to higher elevation access points for winter backcountry is already limited in WA. Every ski area in the state is suffering from a lack of parking due to an increased number of users, thus limiting the access to public lands.. Taxpayers already need more access, not less. You should be plowing more of Hwy 20, especially on the west side to access more Trailheads and more options for backcountry users to ease the pressure on other areas. We appreciate your rapid response to the concerns already brought up. Higher-elevation access to the mountains is extremely important to all winter recreation groups, including the backcountry skiers and snowboarders we represent. The decision to limit access based on vague funding concerns is troubling. It ignores the limited options for winter recreation and the growing demand for places to experience Washington in the winter. If funding is truly a concern, let's work together to find the money. Gating a road closer to sea level is unfortunate, and pretending it is a bonus to winter travelers is insulting. We look forward to meeting with you next year to work out a solution that preserves the important connection Washington residents have to the highway 20 corridor. Please plow the road and encourage healthy activities for Washington by keeping the road open at the original closure. Washington residents enjoy the outdoors and the lower closure is too low to enjoy winter activities like snow camping and back country skiing. This new location severely limits one's winter access to higher elevations where thee is good snow. this new gate closure is horrible for all winter recreationists. People trying to ski, sled, snowshoe.... the new gate will never have snow at it, and you will have to walk up a bare asphalt road with all your gear. families will not be able to recreate in the snow with kids if there is a large uphill climb past the gate. Please reconsider keeping access to snow line on the west side of highway 20! As if access to OUR lands is not hard enough.. Another fine example of the state making a mess of things. Blows my mind. This is a huge loss of access for the backcountry winter recreation community. The only way to fix this is to elect representatives who care about funding public land. WADOT will not change unless their bosses change. Please elect representatives who actually care about funding public land. This is the only way things will change. Write to your representatives and vote. Less access is less access. Keep the backcountry open. Devestating loss of access for backcountry recreationists in the North Cascades! Please don’t take away the well-used access we have counted on. if theres no snow to plow, gate open. If snow is present no plow, gate closed, no problems.. simple? I strongly oppose this move. This would be a huge loss for winter Backcountry recreation. As more and more people gain interest in Backcountry exploration, we should be moving the gate further east, not west. This new closure complicates things significantly for me as a backcountry skier. 4 miles adds a lot and will change my options from day use to multi day use at a minimum. Please continue plowing to the higher location. The whole point is to be able to access the snow line. This move does not "improve " everyone's experience . There is a deeper reason that this change has been made. I find it hard to believe this is an altruistic change. It is a bit insulting that this has been presented in such this way. Bozeman Mt Came up with a plan to keep access open to the local ice climbing, Hyalite Canyon. Let's prevent an adversarial mode of communication and explicitly present what both sides want and fix this problem. I hope I never see another statement like "Change means more room to roam for SR 20 winter adventurers" in our local area again. This is propaganda and represents the fissures and divides on national politics. I have been a loud supporter of WASDOT. As the Sheppard of our winter road safety, my praise has been lavish. Myself and other winter drivers have every reason to be grateful. But the statement above shows a tragic interest in the manipulation of opinion. My trust and appreciation are shaken. Thank you for your reconsideration of the gate closures. It really matters. And we all are grateful. But whoever wrote that original notice needs to reconsider their role in public service. We work together. Washingtonians don't do spin. There is no better use for my taxpayer dollars that to grant me access to my public lands in winter. WSDOT needs to consider that backcountry skiing, along with many other types of winter recreation, are seeing exponential growth. The entire west side has only a few roads that stay open in the winter to an elevation that can reliably give access to snow, winter conditions, and terrain that we love. The timing of this announcement, coupled with the laughable attempts to spin this as "more room to roam", have shown how little consideration for public input was put into this decision. It is nice that you are planning to attend a snowmobiles group meeting, but what about everyone else? Please keep the road open to the normal closure point and do away with this poor decision! Friday, Jan. 4 Update – Based on the extended forecast for the week of Jan. 7, 2019 we’ve determined snowfall along SR 20 near milepost 130 is not expected to be significant enough for winter recreation. 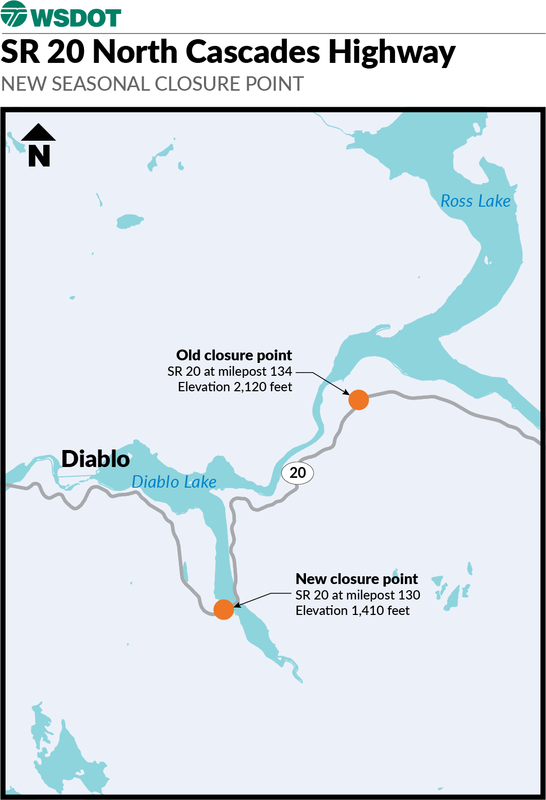 Therefore, barring a change in the forecast and significant snowfall at lower elevations, the seasonal closure point on the west side of SR 20 will remain at milepost 134 until at least Monday, Jan. 14. Hi, Ari - Snow is forecast for this area, and most of western Washington, starting tomorrow morning (Friday, Feb. 8) into Saturday, with additional storms in the forecast for next week. That I'm aware of. Still a curious assumption there will be size-able snow pack. This is so lame. When you actually might want to actually get to the end of the road, you cannot due to this new policy. I am not sure what is meant by " for the safety of travelers and crew", this is simply a cost cutting scheme. Again with the obfuscation and statement of false intentions. Road is now closed at Colonial Creek Campground. I was told to contact the Sedro Maintenance facility to voice my concerns. I am trying to figure out where the facility is and what number to call. I may just drive over since I live close by. It sounds like the decision is set for this winter, but they may reconsider for next. Thank you for the comment, Jason the Son #1. We’ll make sure to share it with our maintenance team who handles this stretch of highway. Yes, we moved the closure point on Thursday, Feb. 7 in advance of the forecasted snow. The seasonal closure point will remain at milepost 130 to the west and is at milepost 177 on the eastside until the snow stops and we start the clearing process for the season. We will be discussing this change following the seasonal opening and will include your comment in that discussion.